Touch Recovery by Team Win for Galaxy S3 I9300 has received a new update to version 2.5.0.0. 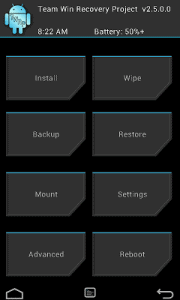 Installing Custom Recoveries on your device will help you install Custom ROMs, root or install MODs. The entire interface of the recovery menu is touch-driven, so no more volume rocker anymore. I will aid you in installing TWRP 2.5.0.0 on your Galaxy S3, but first let’s go through the requirements. This tutorial only works for Galaxy S3 I9300. You will need to use Odin, so make sure Kies is not working in the background. Also install USB Drivers for Galaxy S3 on your PC if you haven’t already. Proceed on your own risk. We cannot be held responsible for any damage. Now you’re ready to start installing the recovery. Download Odin from here. Extract the content on your PC in a folder. Now download openrecovery-twrp-2.5.0.0-i9300.tar from here. Go to the folder where you extracted Odin and run the program. Turn off the S3 and connect it to the PC with the USB cable. Enter Download Mode. Press Volume Down + Home + Power simultaneously. If you have the drivers installed, Odin should recognize your device and a yellow square should appear in the left upper corner. Make sure you have “Re-Partition” NOT checked. Click on PDA and add openrecovery-twrp-2.5.0.0-i9300.tar from your PC. Click ‘Start’ and wait for Odin to finish the installation.